We are delighted to have been Flood Risk consultants for two successful planning applications for landmark commercial developments at Belfast Waterside and Graham House. The applications were granted permission in mid-August 2018. As trusted experts in our field we were awarded the Flood Risk Assessments (FRA) for both highly prestigious projects. To find out more about our Flood Risk Assessment service click here. 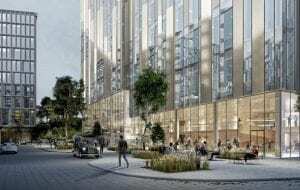 Belfast Waterside development is Grade A office scheme covering 28,476 square metre and is estimated to bring £50 million initial investment and provide space for 2,500 employees. 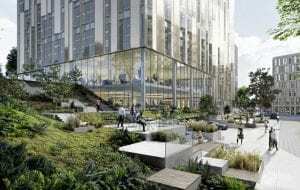 The building will be located near Short Stand and span 13 storeys, apart from office accommodation the plan involves creation of retail, cafe and restaurant units on the ground floor along with landscaping, public realm works a pocket park and pedestrian and cycle access. The application is part of a master plan which will transform the former industrial site into modern space that is suitable for the up and coming city of Belfast in meeting the demand for space moving into the future and will involve sustainable mixed-use provision of apartments and offices. The development will support Belfast City in meeting its future housing and commercial space needs. The Graham House is a 11-storey development located on Albert Square near city centre and worth £20 million, the building is to provide grade A office accommodation for 350 staff and include restaurant and cafe units at the ground floor. The requirement for high quality office space has been in demand in Belfast for a number of years and the development will contribute to meeting the current shortfall and come as a welcome development for prospective employers in the city.